Porsche automobiles can be summed up in a few simple words: Performance, passion, perfection. Porsche owners understand the prestige and privilege epitomized by possessing one of these priceless vehicles. Whether you own a Panamera, Macan, Cayenne, 718 or 911 model, you understand the importance of finding an impeccable Porsche repair shop in Tempe, Arizona, to have your vehicle serviced and cared for properly. The iAUTOHAUS BOSCH Authorized Service and Repair Center specialize in the repair and maintenance of fine European automobiles and the Porsche brand is one we genuinely love. Our Porsche Master Technicians are not just technicians, but Porsche enthusiasts who understand the heart and soul of a Porsche. Our entire Service team will not only get to know your car but get to know you and help keep your Porsche performing at its peak! Your luxury car deserves the best. Trust iAUTOHAUS for all of your Porsche repairs. Call 480-317-0783 to schedule your Porsche service today. Whether you drive a 911, Boxster, Cayman, Panamera, Cayenne or Macan, you can trust your prized possession is in great hands. Our modern, high-tech facility house 12 service bays and we use factory diagnostic tools as well as quality Porsche and OEM parts. For added peace-of-mind, parts and labor come with a 24 month/24,000 mile warranty. Oil Service, scheduled maintenance, IMS, A/C, alignments, battery, brakes, transmission, check engine lights and so much more…we are here for you and your Porsche! Enjoy a comfortable waiting area, free wifi as well as free shuttle service- we will also hand wash your Porsche upon service completion! Porsche mechanics at iAUTOHAUS are well-versed in what it takes to keep your Porsche running at peak performance. Stop by our service center to experience exceptional customer service and tap into a remarkable range of Porsche knowledge. As the Porsche slogan emphasizes, “There is no substitute.” If your Porsche is experiencing an issue, don’t settle for anything less than the best. For Porsche owners, the answer is the iAUTOHAUS BOSCH Authorized Service and Repair Center, where we get repairs right the first time. Bring in your fine European vehicle and let one of our exceptional ASE-certified Porsche specialists get you back on the road in no time. Call 480-317-0783 or book your Porsche repair online. Looking to upgrade or add to your Porsche collection? Visit our Sales Department to see our fine selection of Porsche vehicles as well as other European makes. All of our pre-owned inventory is hand-selected and our Sales staff is well versed in EURO CAR! Trades are always welcome and we can assist with finding the perfect financing options (OAC) as well as quality extended warranties. 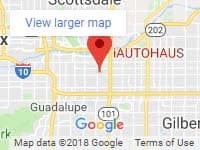 Family owned and operated our dealership and Service facility is centrally located in Tempe, minutes from Phoenix, Scottsdale, Chandler, Mesa and points beyond! We invite to experience the iAUTOHAUS difference and look forward to the opportunity to serve you!